Here are some of my favourite items available this season for an Autumn Chic look. Theses are some of my favourite new fashion and beauty pieces from River Island, Yumi, Kate Spade New York, Urban Outfitters, Nails Inc, M.A.C Cosmetics, Forever 21, Topshop and Coast. If you would like to see any of my previous wish lists you can find them here. My favourite item is the Yumi Deer and Flower Top that has such a beautiful print and is such a good price. The bird, dear and flower is so pretty in a simple two toned navy and white design with added detail with a contrasting collar. I also really like the whimsical purse, Kate Spade Pouch – Fancy Footwork Bella Medium. Not only does it feature a beautiful outer design but is also lined with musical note fabric. Clean, fresh and chic colours have featured in this wish list, in particular the gorgeous River Island Light pink satin box pleat midi skirt. This light pink midi skirt is so feminine and can be a real wardrobe investment piece as it can be styled in so many different ways and with so many alternative wardrobe choices. Teamed up with little ankle boots or on some of our final warmer days with heeled sandals this skirt is sure the flatter and give the Autumn Chic style. 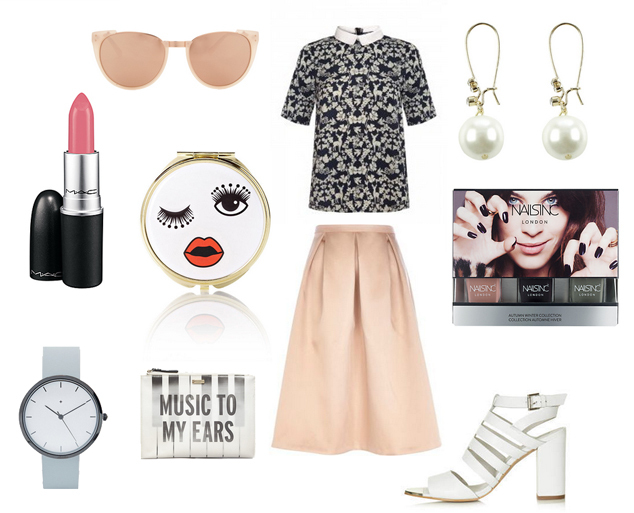 Which are your favourite items from my Autumn Chic 2014 Wish List? Next Post My Blog is 1 Year Old (and 20 days)…. Post 360! What now? !